Bedlam is a design I developed to solve the needs of a client, and in the end turned out to be a design that I still stand by and would be pleased to make over and over. I am therefore accepting orders for it at $7200, with the customer supplying the leather of their choice. Premium woods and finishes available. In reality, "Bedlam" was not to be anywhere near chaotic. It would actually be intensely focused and carefully proportioned. After some discussion and brainstorming, I started to conjure an original piece that combined every element that I thought a bed needed, and no more. 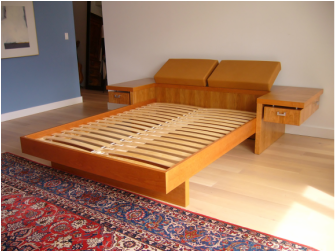 I designed a queen bed that would not need a bulky box spring, would have independent adjustable padded leather headboards, integrated side tables with hung drawer compartments, all with clean cubic geometry and the beautiful fruity grain of cherry. 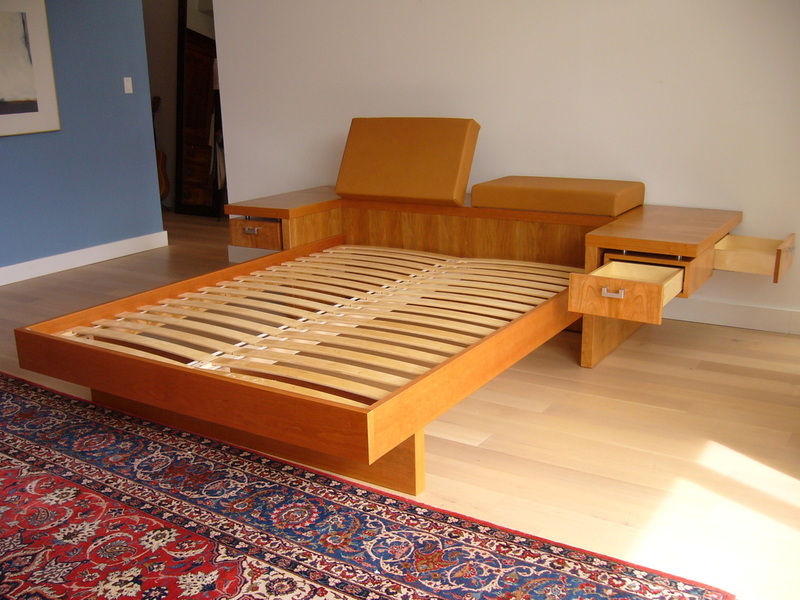 I admitted that I was attracted to some of the platform bed designs out there for their Zen look, but I felt that there wasn't a complete design that combined a "loft aesthetic" with actual day to day living needs. I was also adamant that I didn't want to create something that was going to break someone's ankle as they walked by. 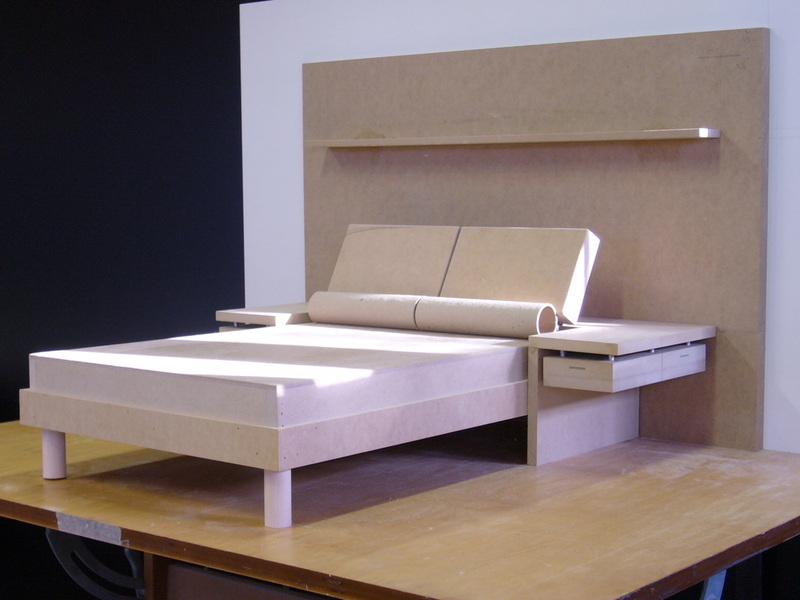 In the picture of the model, you'll see that there's an additional wall at the head of the bed with a cantilevered slab shelf. This "head wall" was an option which might be executed one day. 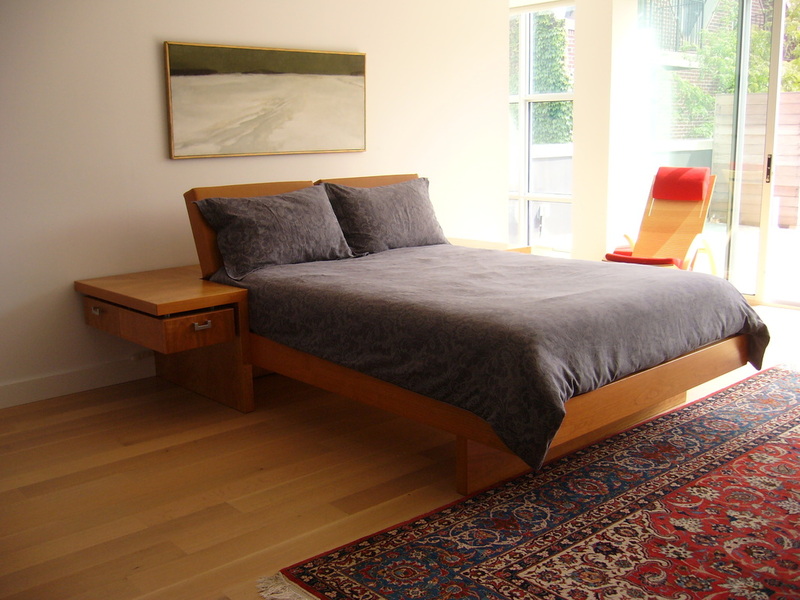 I'm thinking that this extra wall would border the position of the bed quite well, and it might look great with a grid of square cherry panels, or... brushed patina copper panels, or...? ...anything's possible. This was the forth major project I did for these clients over a couple of years, and each one worked out so well. 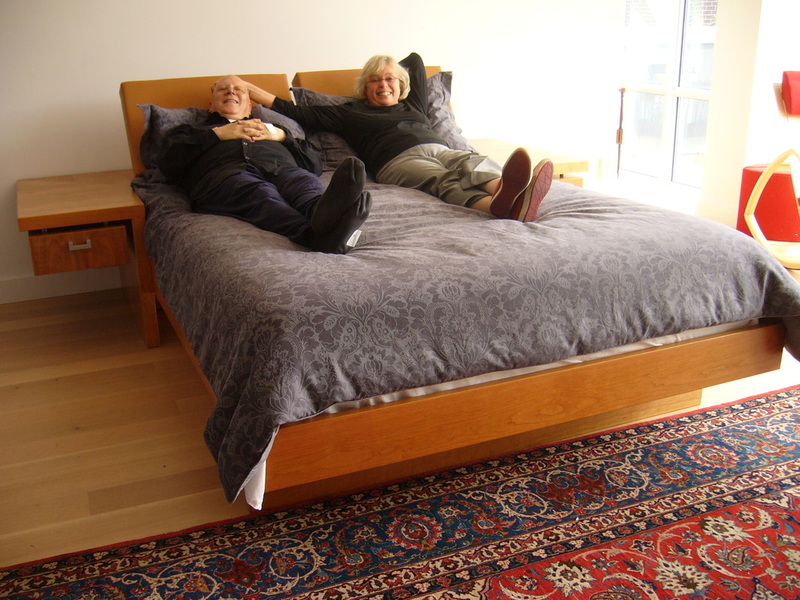 Two days after delivering this bed, I got this email from them: "We are loving the bed. I still think it’s the nicest bed I’ve ever seen and appreciate it every time I go into the room, as I appreciate the beautiful wall unit every time I go into my study. You are a master – a true artist. Everything you do is unique and it’s a real privilege to live with your art." Nice. I'll tuck that one away for a rainy day. Premium woods and premium finishes are available. Let's talk.